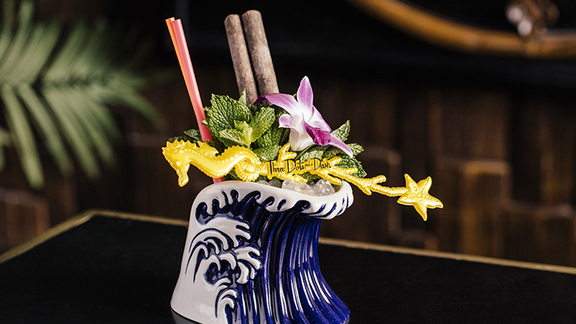 A tiki drink of dreams from our pals at James Beard. This tiki-inspired cocktail gets its spark from the interplay of light and dark rums, combined with a signature allspice syrup that rounds the drink out with just enough subtle heat to draw you back in for another sip. Combine all ingredients in a cocktail mixer filled with crushed ice and shake well. Pour into an Old Fashioned rocks glass and garnish with a sprig of mint. This recipe was originally published on June 15, 2017 at jamesbeard.org. A comic for your cocktail. Time to live a little, wine drinkers. Michael Serpa trusted his gut, and his gut built one of the most industry-beloved wine lists in Boston. Like, so close. Here's a few ideas to freshen up your finish line repertoire. Ask a Scientist: What If The Dude Was Vegan?